Jock Drummond was not properly a Falkirk Bairn, but he was good enough for me, the family was living here by the time of the 1881 Census. he was originally from the Hillfoots. But it would seem he grew up in the town [so if it was up to me I would give him a passport]. Like many of the great players for Falkirk FC he seems to come out of nowhere, but this is more to to do with the lack of 2nd XI matches being reported, then, as now, in the local press. In his time at Falkirk Jock spent a lot of time at left back, but I suspect this may be more to do do with the fact his partner would have been worse. He was a class above Stirlingshire football. He even extendended his range to play when needed, at Left-Half. In his memoirs [published in the Rangers Historian [a surprisingly un-bigoted publication]] he remembered learning under Pat Murphy to play LB. According to the Falkirk Herald, before he moved to Rangers [you must remember this was a time before the current nonsense] he was scouted & tempted by English clubs like Wolves, Preston etc, but he stayed in Scotland. But not because he was a hun, because he had a fine job as a Bank Clerk in Falkirk, and refused to leave the town, he would travel to the match on Saturday, but he would never leave the town. After a long career with Rangers he returned to Falkirk, but not really as a player, but a director, well more as a director who would play when needed. He did not play much second time around, but must have been a great boon to the others about him. John Drummond has a few things about him which will never go away, he was the first Falkirk player to play for Scotland: he is the first player known to have scored a goal from a Penalty Kick for the Club [Falkirk scored another two weeks before, but the scorer was not recorded], he is another who played before his 18th birthday. When it came for him to eventually hang up his boots he was was only playing in goals [but still playing] he played for Falkirk FC in a post-season tour of 'the North' when he played against a Morayshire XI on the 7th May 1907 [this being the 20 years & 21 Days after the first time he turned out for that amateur team]. 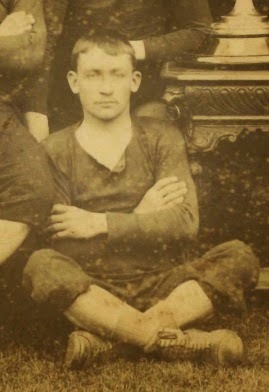 Selected for the 1891/92 International Trials. Alex "Buttons" Stark was probably Falkirk FC's and certainly my favourite player in those years before the club joined the League. Sandy, as he was sometimes known, was a born and bred Falkirk Bairn, his Family home being on Kerse Lane backing on to Bell's Meadow, the family running a dairy business. Apart from being registered as a scholar in the 1881 census I have never discovered what Alex did in the real world, but it is highly likely that he helped in the family business. the earliest he shows up in the extant match reports was during the 1884/85 season when it was mentionied he scored in the 2nd XI's 7-2 win against Tayavalla 2nd XI in the New Year's matches. 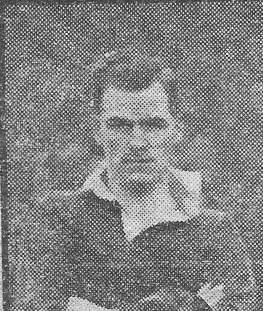 Throughout the random reserve matches that the Falkirk Herald noted he had scored some 6 goals in four matches for the reserves all at Inside-Right to Alex Rule's outside-Right, and it was this form that must have prompted the committee to include him in an end of season friendly against Rangers Swifts, taking his, soon to be default position, at Outside-Right. The Following season he started back in the reserves, but it was not long until he was brought into the 1st XI for his first senior match, a Scottish Cup Second round tie against local minnows Laurieston FC at Zetland Park. Falkirk won by 3-1 allowing the still young Alex to play in the next round against what was then still the most prestigeous opponents in the land: the Spiders [Queen's Park FC]. As was expected Falkirk got thumped, but Alex showed what was to come over the next decade by scoring twice in Falkirk's 3-8 defeat at the hands of the grand old team. Forming a highly effective right-wing partnership with Thomas McDonald [AKA Tommy Donnelly], everything was set in motion. alex stayed at Outside-Right for the next decade [only occassionally switching to the other flank or Inside-Right when needed]. He quickly became a fan's favourite [I would say he became a legend, but that he is largely forgotten today], and it was a regular argument between FFC & ESFC fans as to whether he or Lawrence McLachlan were the best player in the county. Of course, he was always highly in demand, for guest appearances for benefit matches by other other clubs and by various XI's, but also from other more predatory clubs wishing his services on a more permanent basis. Therefore the Falkirk fans were crestfallen when it came to light that he had signed professional terms with Bolton Wanderers in 1889. Yet at the start of the following season, he was still there at Outside-Right for his hometown club. It is difficult from this distance in time to glean what exactly happened. Perhaps he just changed his mind, perhaps he didn't like Bolton! At the time Scotland had not yet recognised professionalism, so his professionalism down south would have barred him from Scottish football, but due to the little fact that he never turned out for Bolton Wanderers therefore never recieved any money, in Scottish Football he was not a pro, so could still play. the only ramification of his folly being that London Casuals refused to play against Falkirk with Alex in the side when they visited in a holiday fixture that year. Alex came close to national recognition when he was chosen to play in the international trials, but Glasgow bias ruled as much then as it does now, and he was overlooked. Yet at the time there was an intermediate level for footballers to demonstrate their skills. Between club & country there were still Inter-County Matches and for a fair while a Stirlingshire XI was not a Stirlingshire XI without Stark, McLachlan & Inch [another legend of the 'shire]. During his last season with the club [and his last season in Scotland], Alx spent a fair chunk of the season guesting with Queen's Park, but as he had already played in the Cup for Falkirk he could only play in friendlies for them. But in the end, he was a young man with a limited future in a game which paid little and offered next to no security, worse still he was only the third oldest son in the family, so had little chance of taking over the family business. So it was in 1895 he announced his emigration to New Zealand to go into business in a meat-packing factory with his uncle William [a former Stirling County batsman who had emigrated some years earlier]. And there the trail ought to have gone cold .... were it not for google! For, playing about on the internet a while ago, to my surprise my Alex Stark+New Zealand+Football searches brought one or two interesting results. 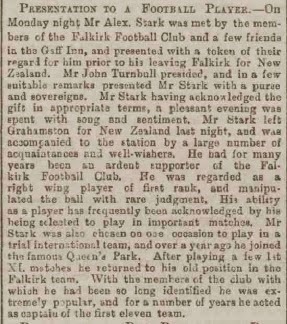 It seems [confirmed by NZ Soccer's Historian] that Alex got involved in his new country's football scene, becoming the president of the Canterbury FA and Vice-President of the NZ FA, crowning this with an appearance in New Zealand's first ever representative XI in 1904 -alas, it was against a touring New south Wales XI so FIFA denied it international status. A strange thing is that for all that is known about Alex, I have yet to find a definitive likeness of him: there was reported in the Falkirk Herald that his image was in "one of the evening papers in 1887", but I have yet to track it down; also I have a photocopy of an article about Falkirk FC which has a photo which purports to include Alex, but the contrast has reduced the entire team to a single amorphous blob, but there must be one out there ... even if only in New Zealand. Linlithgowshire 1887/88, 1888/89, v Fife 1890/91, 1891/92, 1893/94. Finally - that nickname! I have no idea as to why he was called buttons, not a clue. 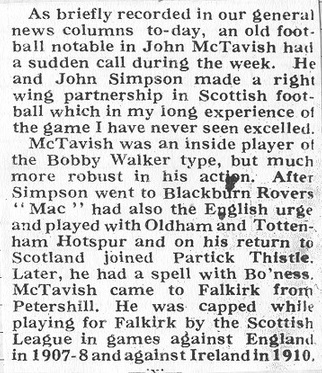 But I can tell you that the Club Secretary Robert Bishop was moved to write to the Falkirk Herald on several occasions of its use in match reports. Make of that what you will! 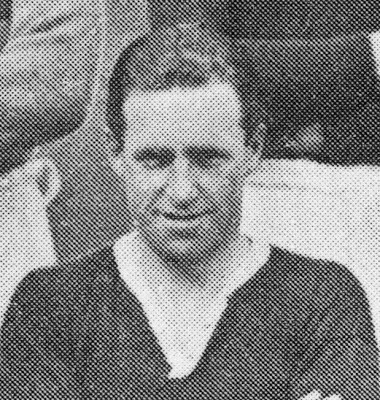 Thomas Scott came out of nowhere: in 1916/17 he was nowhere to be seen, from 1917/18 he was an almost ever present at Right-Back in the Falkirk FC side. This is obviously not true, but it is how it seems to someone looking back with only match reports to go on. Of course he must have been making waves with Denny Hibs before he joined Falkirk, but this was during the First War and there was limited coverage of Football at the senior level, never mind the juniors. When this is added to the fact that there was no reserve football for him to be given a trial it does seem like a true deus ex machina. Make no mistakes he was good, nobody lasts that long in the top league in his country without being good, but it looks odd that he was never selected for the national team. He did play for the Scottish League against the English League when it was still an important fixture, and was chosen by the Scottish FA to go on their 1927 tour of Canada, but it takes a sheen off his otherwise remarkable career. I can not say why he was never capped, nor why he was never pilfered by an English League club [as so many were]. Sometimes though we should consider the fact that footballers are humans too, and maybe he was not all about chasing more and more money. Consider the facts that we know: Thomas was from Denny, his first serious engagements with football were with his local club Denny Hibs, when he came to the notice of bigger football clubs he joined Falkirk [just a short train ride away, this was when Denny was still on the national railway system], he stayed with Falkirk for more than a decade. The only aberation being a season with Morton when Falkirk released him. After he retired from football he stayed in Denny until he passed away in 1976. It looks like me he was just contented with his life, as a professional footballers he would earn more than most without needing to leave his town and family, for some people he had an almost perfect life. Some people can do without moving to some grimy industrial mill town in Lancashire just to get a bit more money. He came agonisingly close to playing 500 matches for Falkirk FC, but in the end never quite made it, however it is a bit of a consolation that altogether with his matches for the Scottish League & the Scottish FA, plus his season with Morton he did get to at least 504 in his career [there is a chance he would have played more matches, guesting with clubs and various elevens in benefit matches, but these are difficult to track down] which puts him in a select group for his time. 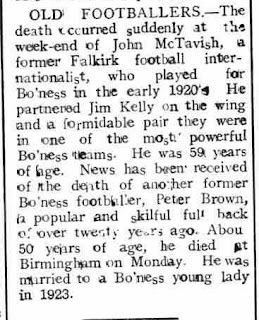 To be noted is his scoring record, which is very good for a Right-Back in a time when the backs rarely left their half, but this is explained by the fact that for most of his time he was Falkirk's Penalty taker [but remember in the pre-WWII era, excepting handball, you had to nearly assault a player for the ref to give a foul, never mind a penalty]. Match reports of time say little, but one of the many anecdotes surrounding Thomas was that when Falkirk were given a penalty, the skipper, Tom Townsley, would stick two fingers in his mouth, whistle and Tom Scott would start his long run up from Right-Back straight to the Penalty Box and in one fluid movement would whack the ball past the hapless goalie. I'm not sure if that is completely within the laws of Football, but I choose to believe it must have happened at least once for the story to get about. Played for Scottish FA XI v Montreal All-Stars at Montreal, Quebec, 24th May 1927. Played for Scottish FA XI v New Ontario All-Stars at Fort William, Ontario, 1st June 1927. Played for Scottish FA XI v Manitoba All-Stars at Winnipeg, Manitoba, 4th June 1927. Played for Scottish FA XI v Saskatoon All-Stars at Saskatoon, Saskatchewan, 8th June 1927. Played for Scottish FA XI v Calgary All-Stars at Calgary, Alberta, 12th June 1927. Played for Scottish FA XI v Upper Island All-Stars at Nanaimo, British Columbia, 18th June 1927. Played for Scottish FA XI v Northern Ontario at Timmins, Ontario, 1st July 1927. 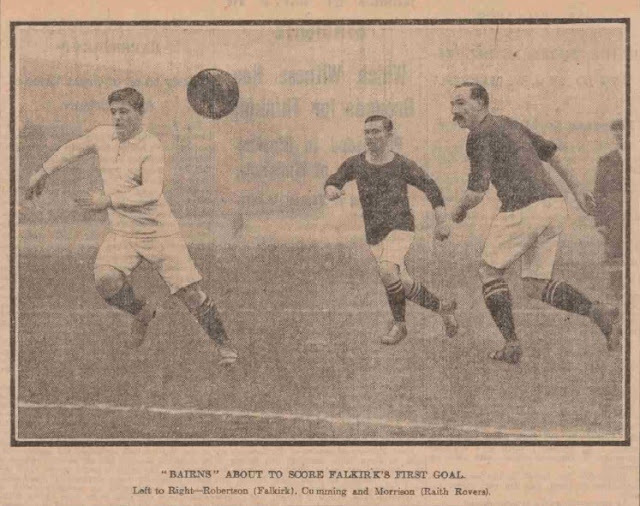 I have hugely overlooked what can only be described as the best signing Falkirk FC ever made, in 1910 Blackburn Rovers signed Jock Simpson from Falkirk for about £1850, this was a lot of money in 1910, but Blackburn Rovers also added the League papers of James Robertson. Often overlooked, but for a free transfer he scored over 100 goals for the club in the next eight years, during a period in which he was often off fighting the Bosch with the Highland Light Infantry. It was reported in the Falkirk Herald that he was awarded the Distinguished Conduct Medal, the Military Medal & the Croix de Guerre for his exploits on the Western Front, but I have no way to prove this yet. Jimmy was a big lad, in an era when most Centre-Forwards were, pictures of him in the team line-up show how bulky he was compared to the other players. When given a run in the team he scored lots of goals [this necessarily declined from 1914-1919], I reckon without the War he would have been up about Bobby Keyes' number of goals. I was going to check the new bit of Camelon Cemetery in case something surprising turned up, and also with the hope that I might come across the grave of James McPhie, but when I checked my book of collected Falkirk FC Obituaries [yes, I am that sad] they said he was to be cremated so it is most probable there is nowhere for me to find [I might be wrong I have never had to get involved at the sharp end yet .........]. I wanted to find a grave for several reasons, but mainly because of two reasons I wanted to do a blog post, first he is one of the main links between Falkirk in the pre & post WWII eras [the other being Kenny Dawson, about whom I have already posted] the other being that Jimmy was the youngest Falkirk player I know about for certain [though it must be said William Lees might have still been younger when he played in a Stirlingshire Cup match in 1892, but that is still unclear]. Jimmy was still a schoolboy when he was allowed to play in a benefit match for the first team against East Stirlingshire two days after his sixteenth birthday on the 27th of August 1936. 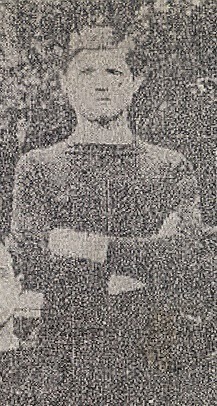 Jimmy had already been a success at schoolboy level, so it was not such a surprise he came to the attention of Falkirk at such a tender age, but in the rough and tumble of Division 1 football in the 1930s [when goalkeepers were knocked over the line by a shoulder-charge and it was considered a goal to the Centre-Forward], but Falkirk kept tabs on him, signing him up professionally a year later. I do not need to say that James was great across all the five back positions because his career lasted nearly twenty years [and average players do not last that long], but he was particularly adept at either Left or Right Back. His Falkirk career [proper] began toward the end of the 1937/38 season, still a teenager, with a huge career ahead of him. But we all know what is coming. To this day I do not understand exactly what Adolf Hitler had against Scottish Football to try to disrupt it as much as he did, but many players had to go to the defence of the SFA, in order that we may now watch what we must. I also do not know if Jimmy actually saw action, but he certainly contributed, being a training instructor in the RAF at the rank of Sergeant. During the War he also guested with Preston North End & Reading [he may have played for more ... [but the abysmal state of research of English football 1939-1945 means I am yet to ascertain the details [This is understandable as apparently quite a lot of England was also engaged in the "Battle for the Defence of Scottish Football [as it is properly known]]]. After Scottish Football had been successfully defended, Jimmy returned to Bonnybridge and to the welcoming arms of a Falkirk team which had not come out of the war as well as it had entered it. This was a period of rebuilding [although Adolph only killed [murdered] one Falkirk player as far as I know [blog post is coming about Edwin Young], Falkirk had played two teams [at some expense] for a lot of the war where many other clubs just stopped, kept their money in the bank and watched from the sidelines, this cost Falkirk FC [and I mean in money] which hurt the club in the immediate post-war era. 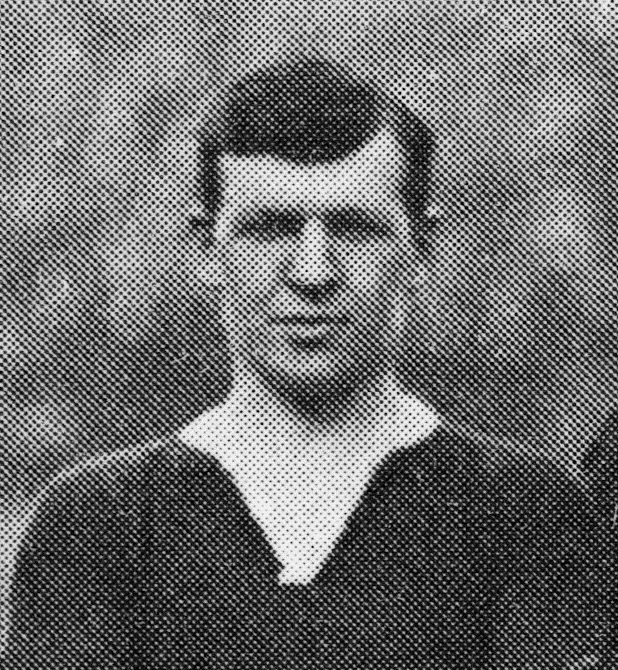 Anyway, although Jimmy played for Falkirk throughout the war when available, it was in his late twentys when he came back that he made his true place among the Falkirk 'greats'. This is very tricky to measure in terms other than longevity and his place in the hearts of the fans, as the sixteen team team Division A meant a reduction in League fixtures, the shortfall being taken up with the group section of the newly introduced League Cup [so there was little chance of catching up with Tom Ferguson who played several seasons where there were fortytwo league games a season], but that is neither here nor there. Football post-war was a different beast from football pre-war. Jimmy was the bedrock of the Falkirk FC defence in the decade immediately after the war, it is strange to see a Falkirk line-up during those years without McPhie [or McPhee] at either 2 or 3 [there were no numbers then, but I mean RB or LB], solid as a rock. 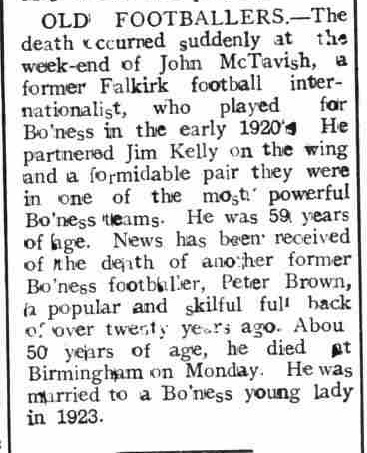 After regular injury made him finally give up football [his last game was on Saturday 11th of April 1953 in a Dewar Shield Semi-Final v Deveronvale]. Jimmy took up the dual role of Falkirk Reserve team manager and coach, and it is here where his place in the history of Falkirk was cemented for a second time [as if it were needed] because in between Bob Shankly and Reggie Smith in the succession of Falkirk Managers stepped Jimmy. Only as caretaker, but it counts as far as I am concerned, for six matches during the 1956/57 season he was in charge, his record of two won, one drawn, three lost is fine for someone who was just holding the reins. It is a whole shame about that whole 'fighting Hitler' thing [in terms of his Falkirk career], it is a shame he has no grave to take a picture of, it is not a shame a lad from Bonnybridge had such a good career with his local League club.